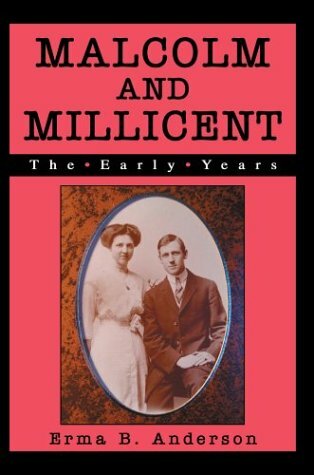 Malcolm and Millicent is a bitter-sweet story of going home. They are newlyweds living in Portland, Maine, when Malcolm receives a letter from his father. Nate wants Malcolm to come home and work on the farm. Malcolm hates farm life but Millicent loves it. Millicent insists that Malcolm make the decision. Nate offered inducements and a surprise for Millicent if they come home. Millicent struggles with issues of a mother-in-law who is not very pleasant and a husband who is quiet and reserved. Follow Malcolm and Millicent through their first 6 years. The ups and downs, the hopes and fears, the determination not to be denied. You will meet sister Hazel and the Belyea family plus other intriguing characters along the way. This book is based on a true story and gives insight into the life and times of one family during WWI in northern Maine. Malcolm and Millicent were Erma Anderson?s parents. Millicent lived to be 89. They spent many hours together. Her memories and family stories give credence to this book. Erma, now 80, lives with her daughter in Greensboro, N.C. She stays active by swimming, yoga and volunteering.